Library News » Blog Archive » Challenge 2: recycle! We all know the benefits of recycling: less into landfill, being more sustainable by reusing, recycling our resources…so this week’s challenge may seem like a no-brainer. Recycle: with meaning & with purpose. The campus waste audit that was held earlier in the year shows that we do recycle, but there is always room for improvement. And you could be in the running for our $30 Coles/Myer voucher, simply by telling us your tip or trick to recycling better. Let us know – here (leave a comment! ), or Facebook or on Twitter. 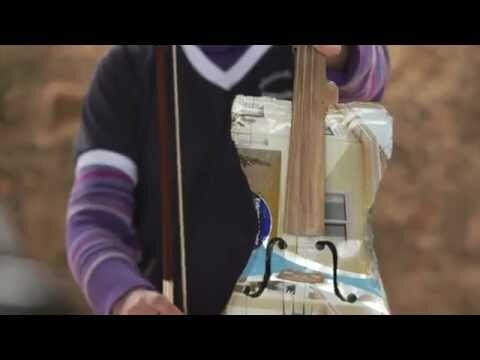 …and if you want to see a great initiative based on recycling, look at the Landfill Harmonic Orchestra. A tip that i never new is that the plastic wrap and covers that come with CDs DVDs, textbooks, and most items that are shrink wrapped or plastic bags that carrots for example come in can be recycled along with plastic bags at your local supermarket! Dont put them in your normal recycle bin, instead keep a plastic bag at home to keep all these plastic items in and once full, pop it in the bins at the supermarket! ( bag recycle bins) So easy and has halved our rubbish at home! I think we have to be careful about understanding the difference between the 3 R’s: reduce, reuse, recycle, and approach our Sustainability goals in that order. They are actually very different actions. Reuse: some materials do lend themselves to being reused/reappropriated, like the orchestra idea. I like to reuse paper for printing that has already been printed on one side. I like to add shredded paper to my compost. This one would be good for campus: “if I get a KeepIt coffee cup I can reuse it 1000’s of times and avoid all those wasted cups from my daily caffeine habit” Imagine the savings on campus! Recycle: this actually means binning it correctly so that it can be transformed into other products. This requires energy use. I like it that plastics can be converted into a new product rather than going to landfill, but it would actually be better if we reduced and reused before getting to this point. These are all great suggestions/ideas Jenny- thanks so much for sharing!! Yes- the final point- do you need that item in the first place…we are such a disposable society, and think we are doing the right thing if we recycle…but that’s only part of it (as you say!). We don’t need to recycle plastic water bottles if we just don’t buy water in the first place. As someone who is passionate about recycling and someone who is conscious of making do on a limited income, my tip for recycling would be to think twice about everything you plan to throw away. How can you make it work for you? For example in our household the leftover bones from our weekly roast chicken are always used to make homemade stock, our egg cartons are used as seed raisers for our veggie seedlings, (biodegradeable)cardboard boxes and newspapers are used to line the garden beds to prevent weeds etc and so on. Remember it is not just about recycling but upcycling, multicyling and everything in between! thanks Liz- we were only talking about upcycling today…..great ideas.